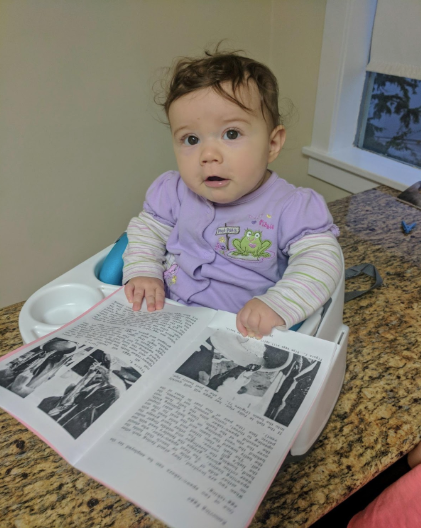 Years ago I learned from Don Holdaway that to promote literacy development a child needs three important activities to happen from birth to school age: playing at reading, playing at writing, and experiencing the bedtime story. I used this knowledge while raising my own children. Now, three decades later, I am blessed with the chance to engage in these three activities with my two beautiful granddaughters, Freya Rose (22 months) and Lyra Eve (6 months). I am so thankful that they both live in a literate home. Freya has a working knowledge of well over 100 words; three early ones were read, write, and book. 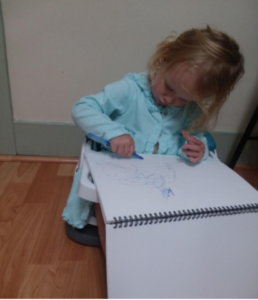 One of Freya’s favorite playtime activities is writing. If I even get a pen out of my purse to write a note or a check, Freya delightedly shouts, “Write!” grabs my pen, and runs off in search of paper (or any workable surface we don’t want scribbled on if paper is not found quickly!). She can spend up to 30 minutes scribbling, which are her attempts at writing. The other day, her love of writing came in handy in an emergency. Her sister had scratched Freya’s eye quite badly, and it was grandma’s job to get her to the eye doctor. In the doctor’s office, she was hysterical with pain and fear. The only thing I could find was a jar of pens to soothe her. I said, “Freya, look. We get free pens at the eye doctor.” With tears streaking her rosy cheeks, she pointed to the pink one and in a trembling voice said, “Pink, mema, have pink.” Holding her new pen in her hand got her through a very scary eye examination. Much later she delighted in playing with her new pens. Grandma grabbed her an extra blue one to go with the pink for doing such a great job with the doc. Katie Wood Ray and Lisa Cleveland (2004) understand the importance of playing at writing as a launch to learning to write well. They tell kindergarten students during the first days of school that they will get to make books. They share that many children already know what a book is and so making one is something they understand. They simply give the children markers, paper, staples, and any other supplies that might make bookmaking fun and direct them to make a book without much instruction. Slowly they begin to teach into this bookmaking or playing at writing. 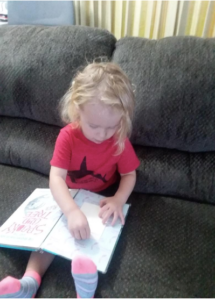 Although Freya enjoys writing much more than reading, she does love reading. She likes to pile ten books on her lap at a time and look at them without any adult interaction. Sometimes she just stacks them over and over in different ways. Sometimes—to grandma’s shock—she throws them. But sometimes, she turns the pages and retells what she knows to be the story with her one- and two-word phrases. Book choice is crucial. She will rarely sit for a story with more than two to three lines a page and prefers stories with rhythm, rhyme, and/or repetition. Don Holdaway once referred to those as the new three Rs of reading. How wise he was. This method has been a go-to for me over the past several years as a consultant for Collaborative Classroom. Last year a kindergarten teacher told me that her students were floundering at the writing independent rotation. I folded a blank sheet of paper, added a colored construction paper cover over it, and stapled them together to look like a book. I told the students I wanted to make a book today and asked if they would like to watch. With rapt attention from 20 five-year-olds, I modeled sketching a picture at the top of each of my four pages, labeling a few items in my picture with initial sounds as the students helped, and then modeled both scribbling random letters and phonetical writing under each of my sketches to tell a story. I then pointed to the large pile of extra blank books I had left at the writing rotation. I told them that when their writing must-dos were done, they could make a book. The teacher said that they all insisted on going to the writing station first, and some stayed for over two hours playing and/or working at writing. So if you are lucky enough to have toddlers or preschoolers in your life, give them paper and pens and books, and read to them often. As you play, you will be launching literate souls and making many happy memories. Holdaway, Don. 1979. The Foundations of Literacy. Toronto: Ashton Scholastic. Ray, Katie Wood, and Lisa B. Cleaveland. 2004. About the Authors: Writing Workshop with Our Youngest Writers. Portsmouth, NH: Heinemann.